Yes, good quality pots and pans DO make a difference when cooking. Just before Thanksgiving I was sent an 8 piece collection of Blue Star Cookware to review. Let me just say that with all of the holiday prep I had ahead of me this set could not have come at a better time. Blue Star makes all it's cookware from professional grade stainless steel which allows for optimal durability and consistent heat conductivity. 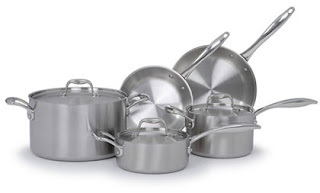 The pans truly made preparing my holiday meal a breeze. One of the best things about the Blue Star Cookware is that the handles don't get hot. I love this feature as I am often in a hurry and grabbing at the pots with my bare hands. Prior to this review I had never heard of Blue Star, but after doing a little research I found that not only do they sell cookware they also sell one of the best gas ovens, professional grade, for the home. The ranges come in various sizes and colors; so there's no need to compromise on what you want. My favorite are the red ranges...this would look awesome in my kitchen....hint hint. I would love to try one of these pro-appliances at home...but until that time I will be happy with my Blue Star Cookware. If you are looking to upgrade I would highly recommend checking them out. Hi there, all the time i used to check blog posts here early in the dawn, because i like to find out more and more. I'm familiar with their stoves, but I had no idea they made cookware! !